With talent and determination, it was a dream come true for Dina Sok and Sopha Nem. After being discovered in Battambang province, they received scholarships to study at the world’s most prestigious circus school, the National Circus School of Montreal in Canada. 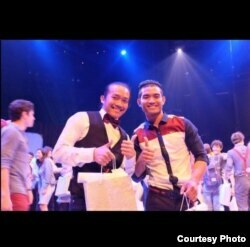 After years of demanding training and study, they each got performing arts jobs in Canada following graduation. While poverty remains a barrier to many Cambodians in the countryside to get good education, two young Cambodian artists, Dina Sok and Sopha Nem, won scholarships to study at National Circus School of Montreal, the most prestigious circus school in the world. After five years of training and practice, Dina Sok recently became the first Cambodian to be selected as a regular with the esteemed Cirque du Soleil and Sopha Nem is heading back to Canada from Cambodia to work later in February. Growing up in a family of six siblings in O-char commune, Battambang, the northwestern province of Cambodia, Dina Sok’s family depended on his father’s income from working as a moto-taxi driver. Dina Sok has become the first Cambodian to work at the world’s biggest circus company, Cirque du Soleil. He told VOA Khmer recently by phone that he still could not believe he is working in the company he has always dreamed about joining. Born in a big family of 12 siblings in which 7 of them are circus artists, Sopha Nem has a story quite similar to Dina. He said his father is a tuk-tuk driver, and because he saw his brothers’ lives get better after they became circus artists, he then joined Phare Ponleu Selpak, a non-government organization helping vulnerable children. He put a lot of hard work into Phare and was determined to succeed. Sopha told VOA he couldn’t believe he graduated from National Circus School of Montreal, the biggest circus school in the world, and could get a job in Canada. Life in a foreign land was not easy for Dina and Sopha. They both encountered many difficulties. Dina was only 16 and Sopha was only 17 when they first arrived in Canada. Sopha told that he had to adjust to the weather and to learn a new language. But the most difficult thing was the food. For Dina, studying abroad, traveling by plane and seeing snow fulfilled dreams. But at the same time he felt sad because he was away from home and from his mother. Little did he know, it was the last time he would see her. About a year after Dina returned to Canada, his mother passed away. Sopha and Dina first started at Phare Ponleu Selpak, a non-government organization, a home and a place of hope for thousands of vulnerable children who have social and financial problems in their families. The pair had the chance to study and work at Phare as they grew up. They were talented and fast learners which led to them being admitted to study in Montreal, according to Dara Huot, chief executive officer at Phare Performing Social Enterprise. Joel Gershon, who is directing a documentary about Sopha and Dina called “Cirque du Cambodia: From Rice Fields to the Big Time,” paid for the tickets for Dina to visit home in 2015 when he saw his mother for the last time. He said he was so moved by them and also moved by how Phare helped young Cambodian children who come from broken homes and poverty. This led him to start working on a documentary about their journey. Gershon said he has been following Dina and Sopha for more than five years to keep up with their progress. In addition to their talent, they are incredible entertainers. Gershon continues. Xavier Gobin, Phare’s former operations director, who worked closely with them before they started school in Montreal, told VOA Khmer that he was so proud to see how successful Dina and Sopha had become. For Dina, those problems would not stop him from moving forward. Instead he keeps his hopes alive. He encourages everyone to work hard and dream big like him. Sopha hopes everyone especially people in Canada learn more about the talented circus artists at Phare, so they have the same chance to go study in Canada. As for Dina, he told VOA that one day he will go back to Cambodia to share the experience with his fellow Cambodians.